Really. 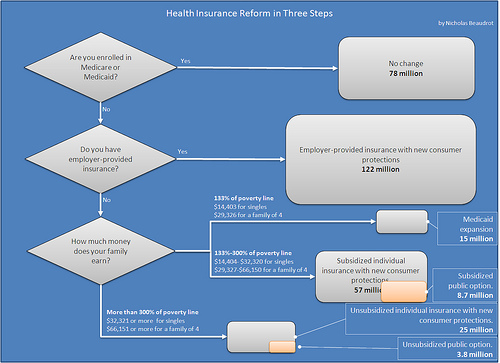 President Obama's healthcare reform proposal ranks highly among least understood policy proposals in current politics. What follows is a concise and easy to understand explanation of the popular but often muddled "public option" that is contained in national legislation and that forms the centerpiece of President Obama's proposal. This one is great for cocktail parties and local bars, because it's so easy to explain. The speaker is Chris Hayes, DC editor of The Nation magazine, and the setting is the Netroots Nation blogger/media conference last weekend. Healthcare reform was very much a dominant piece of discussion there, as it is around the country. After the conference, Nicholas Beaudrot of Donkeylicious transformed Hayes&apos; flowchart-gesturing and converted it into an easy to read and share flowchart about the public option. Click on the image to enlarge it.